Tuxedomoon is an avant-garde, electronic-oriented collective whose music ranges from new wave pop to jazz fusion to more experimental synthesizer soundscapes (usually including saxophone and violin), which were frequently married in concert to performance-art shows. Tuxedomoon was formed in San Francisco in 1977 by two electronic music students at San Francisco City College, Blaine L. Reininger (keyboards, violin) and Steven Brown (keyboards, other instruments). Brown's local theater connections supplied equipment and occasional vocalists in Gregory Cruikshank and Victoria Lowe, plus more frequent contributions from singer and performance artist Winston Tong. Punk and new wave were opening up the San Francisco music scene at the time, and Tuxedomoon landed an opening slot for Devo in 1978 at around the same time they cut their first single, "Pinheads on the Move." Lowe quit the band before their first EP, No Tears, which featured off-and-on members Michael Belfer (guitar) and Paul Zahl (drums). Tong and Belfer departed temporarily, and Peter Principle (b. Peter Dachert) joined as a full-time member. Tuxedomoon signed to the Residents' Ralph Records in 1979, which eventually got them overseas exposure. Feeling that their ideas were more in tune with the European electronic music scene, the band toured Europe after 1980's Half Mute, for which Tong returned with filmmaker and visual artist Bruce Geduldig. After 1981's Desire, the band relocated in an artist's commune in Rotterdam, Netherlands. Within a year though they were forced to leave and moved to Brussels, to find first shelter in the Plan K. (a live p.a. club). Reininger began to branch out as a solo artist. Tuxedomoon was also hired to score a Maurice Bejart ballet, the results of which were released in 1982 as Divine. Reininger left for a solo career in 1983 and was replaced by Frankie Lievaart and horn player Luc Van Lieshout. In between side projects and scoring, the band sought an international deal for their forthcoming LP Holy Wars; it was eventually released in 1985 and became the band's biggest commercial success. Tong left the group for good that year, leaving Brown and Principle the only remaining San Francisco members; multi-instrumentalist Ivan Georgiev was hired to replenish the group's sound for 1986's Ship of Fools album and tour. Scoring work from past projects has been reissued in Belgium. Reininger, Brown, Principle and Lieshout still record together as Tuxedomoon, whilst Reininger, Brown, Principle and Tong have all recorded as solo artists. Quite agree with Stoffeler that the early San Francisco work is the best they did. The first two albums and a few singles were the peak. After they moved to Europe it got too bland for me. I kept listening but I seldom heard anything I liked. The songwriting and playing on the early stuff was unique and really incomparable to any other band. The double Pinheads On The Move compilation that Crammed put out in 1987 has some good early work and some rare archive stuff too. Blaine Reininger reminds me of Bryan Ferry a bit - in that he started out in a cutting-edge avant pop band and ended up crooning MOR material (although his version of Barry White's Playing Your Game is pretty good). What a lot of these type of bands didn't seem to understand (I include Chrome and The Residents in this) is that primitive and minimal does not equal inferior... just as well-produced and accessible does not always mean successful. Still - a good band with much to enjoy. The early work hasn't dated that much which is a great achievement. "I need to see more than just three dimensions stranger than fiction faster than light"
Anyway, they made a few wonderful LPs and singles, especially the early ones made in San Francisco. Tracks like "Joe Boy", "New Machine", "59 to 1" and not to forget "What Use" are groundbreaking. Being in Europe, they started to get a little bit too artistic to my taste. The results were film scores, music for ballets and so on. Still fine, but somehow toothless work. Exception: their "Verdun" tracks (a film score) on Made To Measure Vol.1. Three tracks of minimal music at its best. When Blaine Reininger said "au revoir (can`t say we didn`t try)" later on, the band felt into a deep sleep-musically spoken. 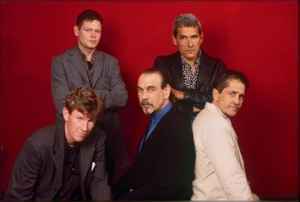 Funny enough, that Tuxedomoon`s quite mediocre LP "Holy Wars" became their biggest success. All in all, a band of importance. And still worth listening.